The emergent community of Fort Dodge, Iowa is also ramping up with an upbeat marketing and branding campaign. With the help of Spin Markket and KCCI, #ThisIsFortDodge has been launched with vibrant and exciting videos and commercials along with social media highlighting the community. #ThisIsFortDodge is a community branding campaign aiming to show the many opportunities that this Midwestern town has to offer. With a focus on the tremendous businesses, people, and opportunities that Fort Dodge has locally, the strategy is very different from the conventional campaign used to advance a community because it gets the community directly involved. Local businesses, with the help of Spin Markket and KCCI, Hearst owned CBS Affiliate in Des Moines, Iowa, have joined together in implementing a digital strategy that brings on board all the community. While the campaign is a simple concept, the participation of Fort Dodgers takes it to another level. 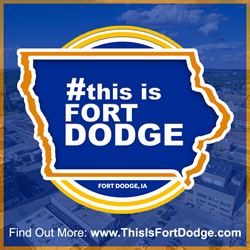 The campaign asks the community to post something positive to their social media platforms that pertains to Fort Dodge, people who live and work here, businesses who go out of their way, families having fun, various events and anything that demonstrates the spirit of the community. Using the tag LETS #ThisIsFortDodge, everyone is encouraged to Like, Engage, Tell and Share along with adding #ThisIsFortDodge. Using photos and videos will create an imagery that generates engagement and social interaction. All together it brings the community in to tell the story of #ThisIsFortDodge. The “pacesetter” businesses that have provided financial support of the project include Clay and Associates DDS, PLC, Eastwood Realty, Friendship Haven, Hart Family Hotels, Shimkat Motor Company, Smitty’s Lawn & Landscape and Smitty’s Garden Center, UnityPoint Heath – Fort Dodge and Infinity Restaurant Group. Each of the pacesetters also provided their personal “elevator speech” that highlights what they personally feel the community means to them. Each of the elevator speeches is available for viewing at http://www.thisisfortdodge.com and on YouTube. Outside of the social media platform on the local level and through KCCI, the campaign also incorporates commercials and a native piece. Over the three-month initial campaign, statistics and data will be collected to further enhance additional campaigns.